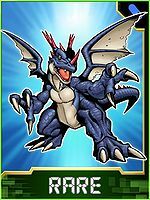 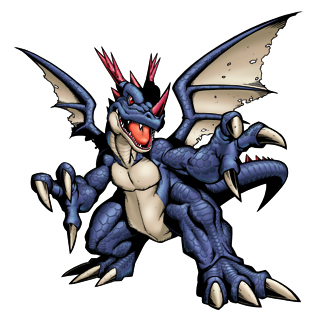 Digimon that bear the name "Dramon" must contain Dragon-factor data in their Digicore; the higher the percentage of that data, the more the shape of their body becomes a Dragon-type, but Coredramon's Dragon-factor data has reached 100%, so it is definitely a pure-blooded Dragon Digimon. 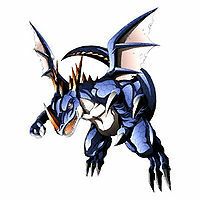 It is said that this blue-skinned Coredramon is the evolved form of a Dracomon that assimilated large quantities of a rare gem called "Blue Diamante", which is mined only in mountainous regions with very high altitudes, and is able to fly at high speed with its developed wings to survive in the steep mountains. 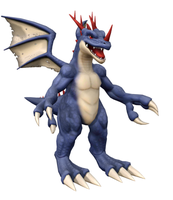 Its Special Moves are unleashing a scorching breath that shines blue (Blue Flare Breath), and using its powerful tail to deliver a bitter blow to the opponent (Strike Bomber). 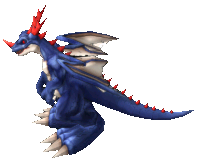 "Blue Flare Breath" has the effect of decomposing the texture data covering the surface of a Digimon's body, so Digimon that suffer this breath will be susceptible to attacks on their bare Digicores. 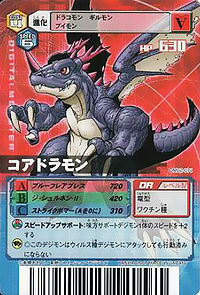 Like Dracomon, it has a scale referred to as the "Gekirin", and if it is touched there, it loses its mind to an excess of anger, and indiscriminately fires its "G Shurunen-II", a diverging laser beam in which it makes the horns on its head glow intensely, and then fires from the back of its mouth. 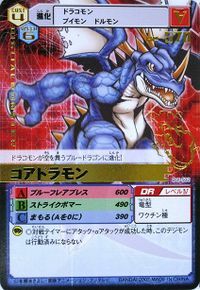 Blue Flare Breath  ブルーフレアブレス Burū Furea Buresu Breathes searing sapphiric flames; can "burn" away the texture map of Digimon targets, exposing their wire-frame, and even their Digicore. 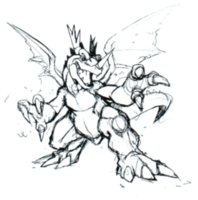 G Shurunen-II [N 1] ジ・シュルネン-II Ji Shurunen-II A state of berserk rage, triggered when its "Gekirin" is touched; Coredramon rampages with laser-heat breath. 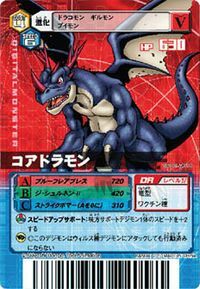 Strike Bomber  ストライクボマー Sutoraiku Bomā Smashes targets with the flick of its tail. 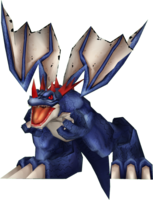 Coredramon (Blue) evolves from Dracomon with 30 Vaccine AP and evolves into Wingdramon with after 10 battles and win percentage over 50% or Cyberdramon with passing time. 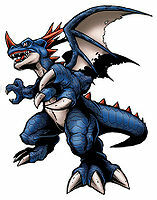 Dracomon has evolved into a blue dragon who dances through the sky! 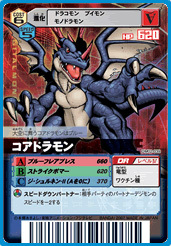 It unleashes its move, Blue Flare Breath, a scorching breath that shines blue!! 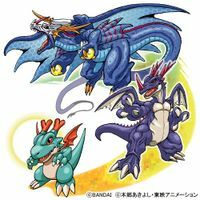 Blue-colored Coredramon are the ones who dance in the skies. Dracomon that reside in the treacherous mountains attained well-developed wings and the ability to fly at high speeds. 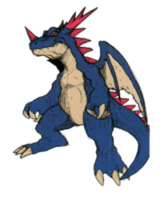 It attained wings capable of flying at high speed in order to survive in the steep mountains! 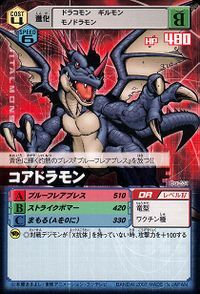 ↑ "G Shurunen" (ジ・シュルネン, Ji Shurunen) is a near-homophone for "jisshūnen" (十周年), meaning "10th Anniversary", a reference to the Digimon 10th Anniversary event. 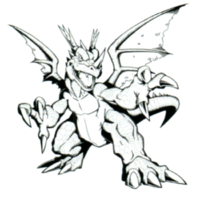 This page was last modified on 10 April 2019, at 09:27.